Spray the crock of a slow cooker with non-stick cooking spray. Place chicken breasts in crock. Combine Italian dressing mix, and water in a small bowl. Pour over chicken; sprinkle with garlic, cover, and cook on Low 4 hours. After 4 hours, whisk softened cream cheese and cream of chicken soup together in a bowl. Pour over chicken; stir in mushrooms. Cover and cook on Low for 1 additional hour. 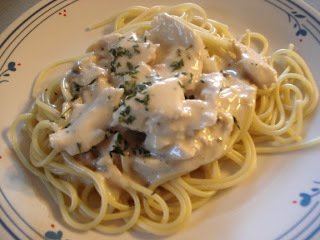 To serve, spoon chicken and sauce over hot cooked pasta and sprinkle with parsley.